I’m back! Well, I was never away. Of course the usual excuses follow: school, work, husband returning from Iraq, moving, etc. Although I’ve been away I haven’t stopped living or loving life! I was excited to get my report that I had over 1,500 views on my blog in December! In January my husband, Todd, decided he wanted to do a detox/liver/colon cleanse with me. He made the decision to eat as healthy as possible along with the cleanse. Really??? Yes. This came from an all-american he-man-woman-hating cheese-burger beer guzzling(sometimes) normal young army guy. At this announcement I was both nervous and excited. Pictures of food spewing out of his mouth, faces or comments about the food, or him losing so much weight he looked like he came from a concentration camp ran through my head. At the same time of course I want the love of my life to experience his optimal healthy body. After everything settled down in January we began our “Todd eats mostly raw and healthy stuff a lot for at least 30 days”. Too long of a title? The first few days were shaky. I was working and Todd ran in and asked if a vanilla milkshake was raw. He used his big blue puppy dog eyes and explained he was REALLY craving one. But alas, as a health food enthusiast, I could not succumb to such trickery. I did however make him a shake at home as soon as I got the chance. Not your McDonalds hydrogenated-oil, high fructose corn syrup, fractioned milk goo, but delicious nonetheless. Throw everything in the blender as fast as possible. Add ice as needed and according to textural desire(nice phrase!) Then quickly put it in a cup and savor to kick that milkshake craving in the a**! We live a very busy lifestyle with friends, family, school, and work. We run into a variety of scenarios, many of which involve food. Wait, that’s every American. Hmm. So because we happen to be normal people we also happen to be imperfect. Neither of us aspire to be perfect, we just try to do our best at that moment, on that day, in that year. We don’t live by rules or dogmatic thinking, and we certainly don’t push our goals onto other people. So, we do enjoy the occasional drink, steak (especially Todd), and sushi. Because of Todd’s high protein needs we found it easiest for him to still incorporate meat into his diet. There are many recipes however that require no cow’s that he likes quite a bit. 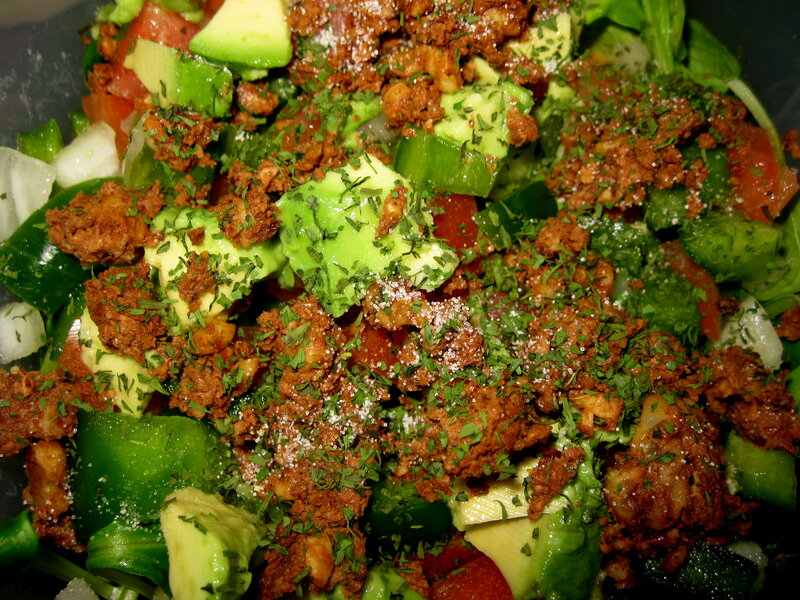 With the texture of taco meat in mind process all ingredients in food processor. You don’t want it too crunchy or too mushy. Carefully add the water, as you don’t want too much. Taste as you go along to get the desired flavor. Feel free to add a variety of spices. Blend everything together. The amount of water will depend on the thickness or thinness of cheese desired. Raw Sour Cream:Process everything. It gives that bite. It might not taste like sour cream by itself, but when combined with other flavors it provides that sour your looking for. You might want to add more or less vinegar. Sometimes I chop it all up by hand, sometimes I use a food processor. It depends on how lazy I am or am not feeling, or if I just want a variety of “chop” sizes. I’ve been none to add red bell pepper to the mix as well. Todd likes it this way:Take one Food for Life Ezekiel Tortilla (made with sprouted grains and cooked at a low temperature)Spread a good amount of cheese. Follow with taco meat. Add spinach or lettuce and salsa. Top with sour cream. Fold it up into a burrito, but refuse to call it a BURRITO and always persistently and determinately refer to it as a TACO.I enjoy it this way, or if I’m wanting something light (and grain-less) it’s delicious as a “taco salad”. Just sprinkle everything atop of bed of spinach or lettuce of choice. Yum.